I never thought about researching where to buy a handbag on my visit to Paris. Paris struck me as a destination for investment designer handbags, from luxury good makers like Hermes and Celine. While I would love to leave Paris with a souvenir Hermes Birkin bag on my arm, I’m not ready to drop ten grand (for starters) on a shopping whim. 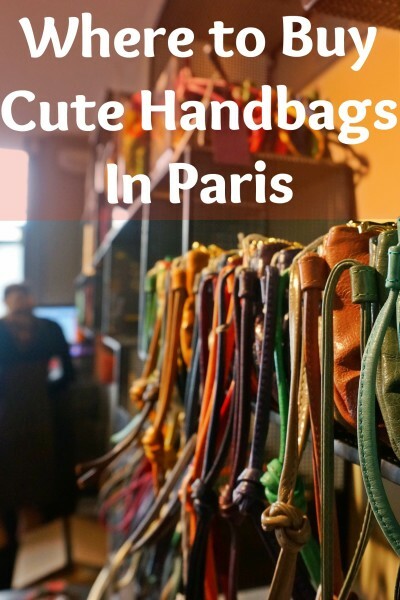 So when I stumbled across a colorful handbag shop in Paris’ Marais district, filled with cute but inexpensive handbags that are actually made in France, I knew I hit pay dirt. 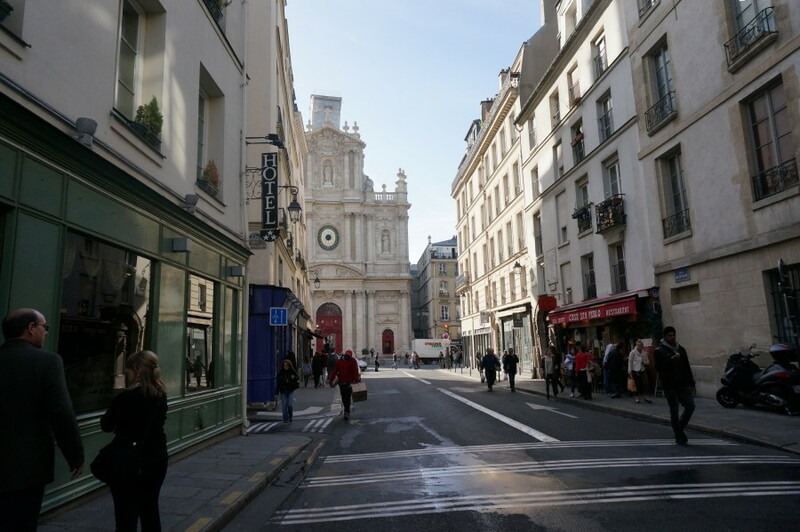 Rue de Sévigné in the Marais is a fantastic street for shopping. Parisian brand Brontibay’s Marais shop on rue de Sévigné is eye-candy for handbag lovers. You’ll find shelves of nylon and leather handbags, satchels, wallets and clutches bursting in pretty shades and Liberty prints. The best part is that these stylish, made-in-France handbags are built for function. 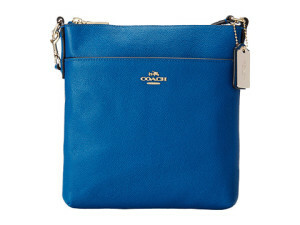 I loved the handbags’ slim profiles (easy to carry under your arm), convertible straps (to wear crossbody or as a standard purse) and incredibly lightweight construction (no more shoulder agony). I also loved the medium-size of most of the handbags– surprisingly hard to find. My bags are large enough to fit my camera but not too large to bring out for the evening. These adorable clochettes were only 29 and 33 euros. 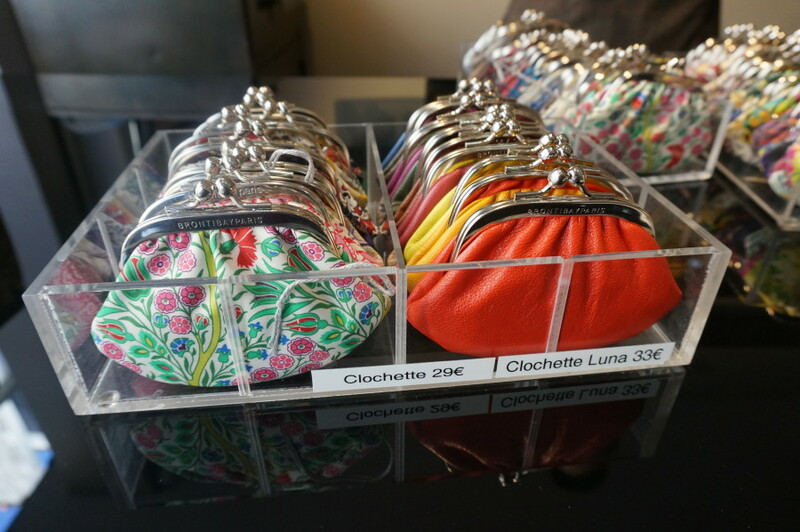 Fun bags with a mix of leather and prints (where to buy inexpensive handbags in Marais, Paris). I am a sucker for Liberty prints. 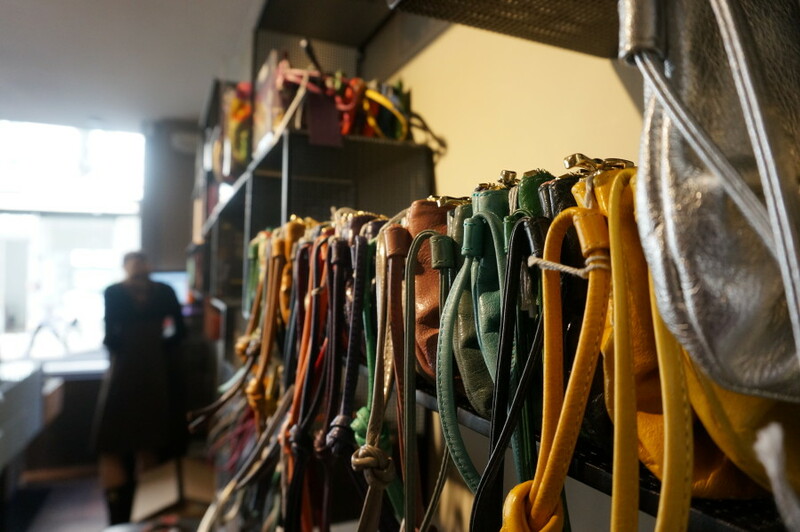 It was hard to choose among the many adorable options in this Parisian handbag shop. (Marais). I love ultra slim handbags, it’s hard to over stuff them. (where to buy handbags, Paris, Marais District). 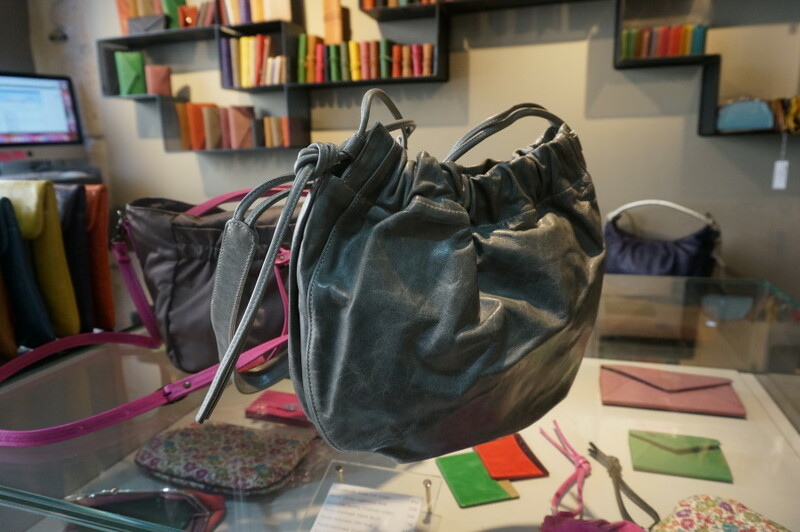 The handbags at this Marais shop were well-constructed with a nice attention to detail (each bag had a pretty satin lining). When I first I glanced at the labels and realized that the handbags were actually made in France I expected some sticker shock. Instead, I experienced a rare case of reverse sticker shock– the handbags were not only inexpensive but downright cheap at about 80-200 euros per bag. 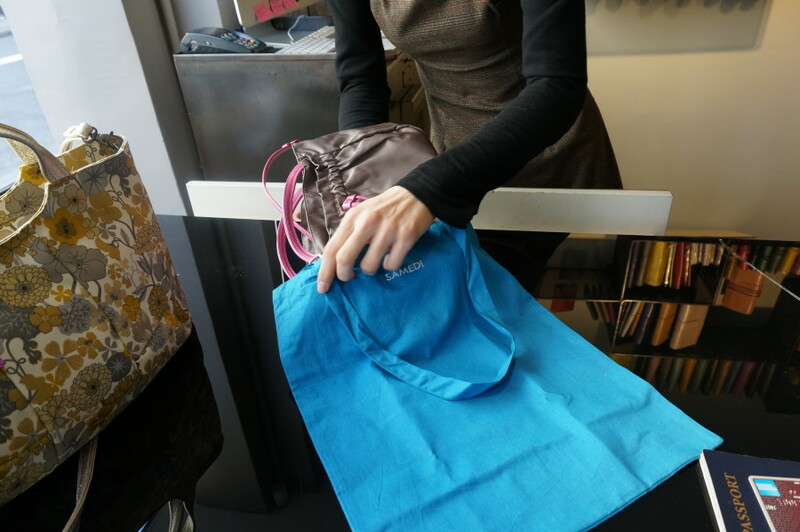 Small accessories like change purses went for considerably less, making the shop a great spot for gifts. I plucked two handbags from the shop’s stock– one nylon and one leather bag. My shopping cohort (in this case, my typically frugal, anti-shopping mom) even bought herself a handbag. Now that I’ve owned my Parisian handbags for several months now, I can report back that the quality is excellent. These are my go-to bags and I carry them constantly. If you’re headed to Paris and love the style of these bags like I do, it’s definitely worth checking them out, especially with the current favorable exchange rate of the dollar to the euro. What to Know: is a cute shopping street (more on that in a future post). Also don’t miss the Musee Carnavelet nearby (and their fabulous gift shop for classic Parisian souvenirs). Bonus, this Paris handbag shop is also open on Sundays, when most other Paris boutiques (especially in the Marais) shutter their doors. 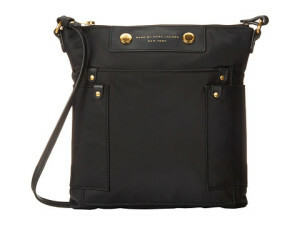 Note: I have no affiliation with Brontibay and bought the bags from their Paris shop on my own dime. 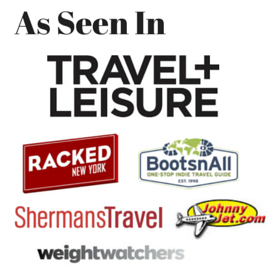 Online affiliate links to my other recommended bags earn me a tiny commission and help me continue to report on shopping finds around the world, so I appreciate your clicks! Have you bought a handbag in Paris? Tell us about your finds in the comments! Alexia Hollinger hand makes all the bags in her Paris shop. She makes her bags from vintage scarves, old leather jackets, and designer fabrics. They are all one-of-kind and gorgeous. Best part is they are very reasonably priced, especially as they are hand made. You can bring her a scarf and have her make it in to a custom bag. These are beautiful bags; definitely worth a visit. I was actually in Paris in Marais when this was posted. Went to the store and showed the sales clerk the posting — she was surprised and delighted. Of course, I did buy a bag and a coin purse. Lovely store! 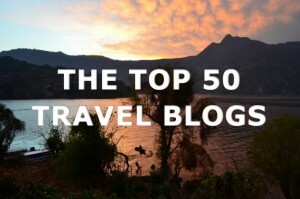 Thanks for sharing this find with your readers! 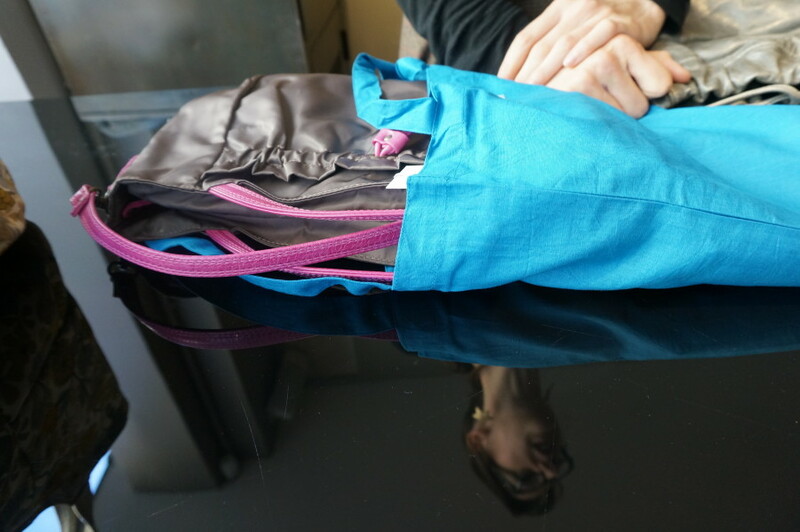 Last April, while in Paris I found a beautiful cordovan leather backpack on Ile St. Louis. It was my favorite Paris purchase, I use it everyday. I will definitely go to the Marais to find the shop when I’m in Paris in April. Bronitbay is my favorite shop in Paris. I go there every time I visit. I bought my first Bronitbay bag in a shop in Gatwick airport about 9 years ago and I still use it once in a while, even though it’s really time to replace it. I was fortunate enough to be in Paris in January one year and Bronitbay put most of their line on sale for the semi-annual January sales that are amazing in Paris. I bought 4 bags at ~75% off of their already amazing prices. I love everything about their designs! I’m so glad you found the shop and share my love of their bags! Awesome post! I like to collect handbags and I’m planning a trip to europe I was investigatin some local designers and found your post I will definitely go there! Thanks will check it out next visit! I am so excited to visit this shop during my upcoming visit to Paris!!! Thanks for the comment! There are some other fun shops on that street too. Also look for my write up on Paris outlet shops (several on that street). Hi there! I linked to the exact shoe, I found them true to size. Just saw this post on Pinterest and thought I would chime in. Last time I was in a Paris with my friend (2014) we bought gorgeous (if pricey) French made handbags at Lancel, just off the Champs Élysée. It looks like that branch has closed now but they have other stores throughout the city. Everything was so beautiful we had trouble deciding. Thanks for the tips! I will definitely check out Lancel next time. The selection at Brontibay’s Marais shop this time was much smaller (not sure if it was bc winter or what) so I’d love to recommend some alternatives. Found a François Renier outlet on de Lamothe Piquet. A ton of choices and colours and great prices compared to retail. oh great! Did you see my new post on Parisian outlets? I’ll add it to the list! I saw this post and attempted to find the location on Google but the only Brontiby shop I could find wan at 13 rue La Fayette. Have they moved? Hopefully you can assist. Thank you!